One Fish, Two Fish, I Love Goldfish | I'm Skinny, Now What? Really. I just…I have no words. 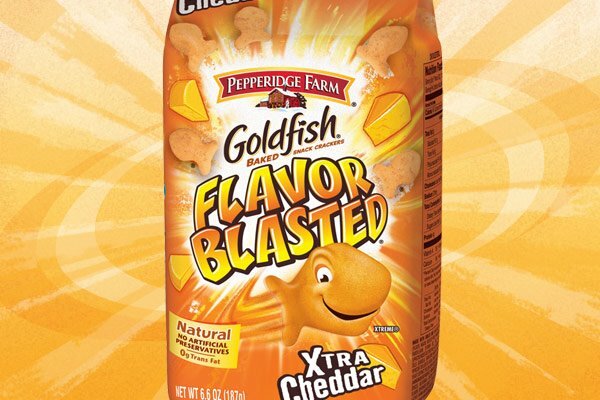 If you are what you eat, then I am a bag of Pepperidge Farm Flavor Blasted Xtra Cheddar Goldfish crackers. Saying I love them doesn’t quite describe how I feel about the salty goodness that comes with each bite. Things are so bad that I have to bypass the cracker aisle at the grocery store so as not to tempt myself. Sometimes, though, a girl just needs a bag of goldfish. I’m aware that it’s a problem. It’s my vice. Just writing this, I want to go pick up a bag (or four). It’s helpful that they’ve gone up in price, because a few years ago I could buy 10 bags for $10. It was insane how many I not only had in my house, but how fast I could go through them. I’d shovel them like it was my last meal. I thought about immersion therapy. You know, eating so many at once that I’d just get sick of them. But that didn’t work; I just ended up with cheese dust covering everything. No one wants to walk around looking like an orange pylon all the time. So what to do? It’s no use denying myself the foods you enjoy when I want them. I don’t crave them all the time; but it doesn’t hurt to have a handful ready when the mood hits. That goes for all cravings. Everyone has their fave type of junk food. For me it’s goldfish crackers, but for others it’s cookies, cupcakes, potato chips, etc. A handful won’t kill you. Eighteen handfuls, however, might be a bit of a problem. When First Lady Michelle Obama started her Let’s Move! campaign to combat childhood obesity, some questioned how that could be reconciled with the holidays. Sure, we people could follow the initiatives pillars of healthy eating and physical activity during most of the year. But the holidays call for turkey, gravy, football and pie. The best way to alleviate that guilt is just not to weigh yourself down with it. If you enjoy cookies, have a couple. If you like chips, have some. Just don’t let that be all you eat. These foods were created to be as snacks, not meals. One of the things it took me a while to learn while on this weight-loss journey was the difference between cravings and hunger. Cravings can be alleviated easily if it’s not caused by hunger. For example, if I’m craving a handful of cheese-dust crackers, I’ll drink a large glass of water and chew some gum. If I’m still feenin’ it after the flavor has worn off on my Orbit Bubblemint, it’s time for some crackers. There’s no harm in water and chewing gum, and I’m not overeating. Once you’ve learned to separate your cravings from hunger, the weight-loss journey becomes more tolerable. You find a way to keep yourself sane when a cookie craving comes along. I know it took me some time, but I hope that’s not the case for you. What are some of your vices and how do you keep your cravings in check? Candy bowls! I can’t walk past one without taking a piece. I don’t keep candy in my office. I never had a sweet tooth until I began this job a year ago. Now, I’m out of control. Ugh, the ready availability makes staying strong so much worse. Before you know it, you’ve walked past the Snickers bowl like eight times.